As a little heads up this review does contain spoilers at some points. A small spoiler is that I haven’t yet beaten all six campaigns but that’s because they all are the same missions and small deviations from the story. For this game we see the return of the Space Marines, Chaos Marines, Orks, Eldar, the Tyranids while welcoming some friends from the past the Imperial Guard who now contain members of the Inquisition. Some of us have been waiting a while for the Warhammer 40k series to continue with Retribution. For this is the game we may finally see the end of a tale of faith, heresy, and redemption. I’ll start this review off with notation of the large changes to the games campaign made. 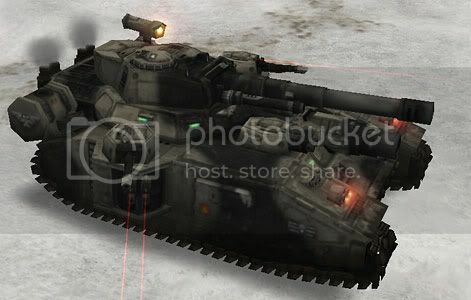 The largest of them all is your no longer limited to four units like in the previous two Dawn Of War 2 game. Rather, we see the addition of the ability to call in reinforcements from a factions teleportation/birthing point. This works a bit like the multiplayer bases you receive a list of units able to be produced and each requires requisition and power resources which are obtained through resupply crates. This of course means character abilities are now all based off of energy from the character. A small change to the game was the new level system. No longer do you have four paths to put your points into, but rather three. When putting a point into a path you receive a new ability constant or manual. Such as the space marine commanders ability of healing himself and allies around him when he damages an enemy. New units and upgrades for units as well as new war gear are now unlocked from the choice menu when you complete a mission. On the topic of units, we see a few new additions for some races. The first new unit we really encounter would be the so called “Noise Marines” for the Chaos. These are analogous to the flamethrower units for the Space Marines and Orks except they use sound generators instead. The weapon sounds a bit like a mix of a bass and electrical guitar. They also have the ability to send out a sound pulse that knocks back all surrounding enemies that are not resistant to knock-back. But enough with the changes for now. Let’s talk about some of these missions. I’ve done a few of them now and started to notice they appear to all be the same mission type for each race, unless you’re the Chaos. You start the game on the lush jungle world of Typhon with the leader of your race (for me this was the Space Marines). This first mission is fairly linear, making your way up and around the map eventually to the top to engage in a battle with your race’s main enemy. For me this was a battle with the Chaos Lord Eliphas the Inheritor. Fairly easy fight. Upon completing the mission we meet the slightly arousing and terrifying Imperial Inquisitor Adrastia. Depending on who you are she contacts you in the way of a radio communication on board your ship or, for the Orks, pops up right behind you. 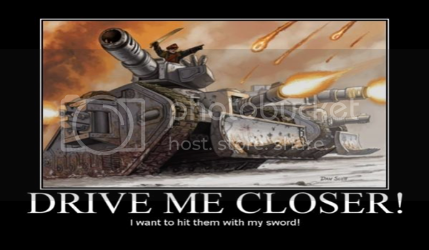 For our second mission we run into our first enemy the super heavy unit for the Imperial Guard, the dreaded Baneblade tank bristling with either seven or eight guns on it. Including in this package is the awe-inspiring demolisher cannon. It’s not too powerful but it’s still effective it seems.